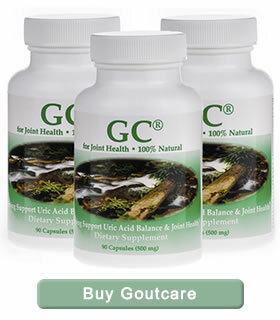 GoutCare (GC) is our signature herbal blend. The herbs in the GC capsules help in this process by enabling the digestive system to work more efficiently helping to keep the gout at bay. This can be continued by adding a balanced healthy diet to the increased hydration and GC capsules. 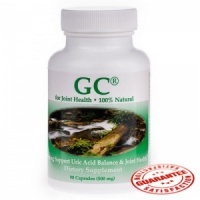 GC is absorbed into the body to aid in the removal of stored uric acid. GC assists in holding the uric acid in a soluble state in order for the kidneys to remove the excess from the blood supply, avoiding the inevitable crystal formation. We recommend a more alkaline diet and a short list of these food can be found on our food and diet page. 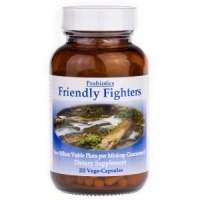 This product is great for the overall health of anyone with or without Gout. This powerful herbal blend aids to enhance blood flow and blood purification, stimulate new liver cell growth and protect the liver from toxins. It increases kidney filtration and excretion, increases the production of bile, and boosts the digestive and immune systems. By doing so, we are addressing all the key areas involved in uric acid control. The GC herbal blend is comprised of food herbs which help support Uric Acid balance and joint health. GoutCare may lower the insulin therapy needs of type 2 diabetics. Please monitor your glucose levels closely and if necessary (with doctors advise) adjust your insulin accordingly. 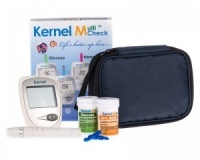 Some type 2 diabetics have reversed their need for insulin all together. The herbs in GoutCare could improve liver function. This can increase communication between the liver and pancreas creating improved insulin output from the pancreas.